What is the DECA club? Standing for Distributive Education Club of America, DECA “prepares emerging leaders and entrepreneurs in marketing, finance, hospitality and management in high schools and colleges around the globe”. 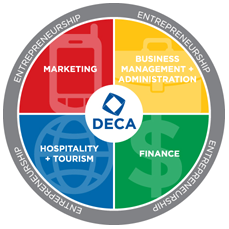 In layman's terms, DECA is designed to help educate those who want to do something in the finance or marketing field, become a manager of some sort or be an entrepreneur. The head honchos of DECA make sure students are learning by giving two part assignments. The first part, is a written test. These tests are graded and compared to help determine a score. This score is also impacted by the speaking portion of the assignment. Students who choose to show up to competitions (I failed horribly in doing this last year) will be given a topic with a question. They must then answer this question and explain their answer in front of a judge. He will give the students points according to how well they handled and explained their situation. The combination of these two scores determine who will advance out the the preliminary round and into states. The process is repeated again to weed out those not worthy of qualifying for nationals. The procedure is used until only one person is left and they are declared the ultimate winner. More locally, the NHS DECA club is pretty good. It’s led by Kyle Seeley and Melissa Persichetti, and it has had success in these competitions for the past few years. Just last year, NHS’s DECA club had two students score the highest in their respective categories. 2017 graduate Mustafa Arain had the highest test score in the NJ DECA State Competition in the Business Services Marketing category. He later went on to win 1st overall at Southern NJ DECA Regional Competition. Ashley Baines placed first overall in NJ DECA State Competition in the Principles of Finance category. Members of DECA have made appearances in states for the last several years. They even had on student attend nationals. Additionally, the NHS DECA club grew 300% from 8 members to 24 members in just one year. DECA is on the rise. For students looking for added resources available to better their education in a field that is covered in the DEAC program, DECA could be right for you. In addition to the growing numbers, recent success shows the NHS DECA club is a good program to join. If you’re trying to build a resume, are unsure as to what club to join, or are just bored, remember, decide DECA.